Well, it’s pretty exhilarating, but you don’t need to worry about bringing a second pair of boxers (however, we do recommend not going “commando” your first time!) Unlike jumping out of an airplane or base jumping (or basically any sport with the word “jumping” in it), you are hooked to a weight-rated cable by a harness that’s inspected and approved by safety experts. At least two guides are with you every “step” of the way, controlling your speed and putting you at ease as you glide through the treetops from platform to platform. Many people with acrophobia find the thrill of flying through the air eliminates that fear. Seriously, we know what we’re doing. We will take care of you! No judging here, but just because of the limitations of the industry equipment, we do have a maximum weight of 280 pounds. Because of the limitations of gravity, there is a minimum weight limit of 60 pounds for the Challenge Adventure Tour, and 80 pounds for the Aerial Excursion Tour. We have to make sure you have enough mass for gravity to pull you along. Do I have to be in great shape to zipline? You don’t have to be an Olympic athlete or a finalist on American Ninja Warrior to enjoy the art of ziplining. Our beginner/intermediate-level course (The Flying V) is designed for those interested in ziplining but not ready to be in the tree canopies for long periods of time. Obviously, our most challenging course does require some skill. The Challenge Adventure Tour takes a couple of hours and utilizes an obstacle course where we throw wobbly logs, monkey vines, and a cargo net in your way. Our Aerial Excursion Tour is less challenging, but you need to be able to carry some weight, climb stairs, and generally handle rough terrain without too much trouble. We do have alternative tours for people with physical challenges! What happens if ziplines stop in the middle? Are team building events available? If you’ve always treasured the thought of your boss screaming for his or her mommy while zipping through the trees, a corporate team-building event is a great idea. We have team building events here all the time. There is nothing like helping a coworker overcome fear to build trust and camaraderie while creating memories that will last for years… “Hey Bob, remember that time you didn’t want to go ziplining, but then you did and now that stock you bought in Fruit-of-the-Loom boxers has gone up?” That’s the stuff of which memories are made! Why am I doing this!?!? While there’s lots of reasons (peer pressure, you lost/won a bet, it’s on your bucket list, your boss is making you), you are ultimately doing this because you want to and because you can. No matter what your fears, trepidations, or hesitations might be initially, you know that life is meant to be embraced and lived fully ~ without fear and regret! Can I make a video of my ziplining adventure? Absolutely! We have GoPros available for rent or you can bring your own camera, as long as we have a way of securing it to the harness. A video of your first zipline is a great memory you can show your children, grandchildren, and neighbors who won’t go home. Just remember that cameras have sound, so keep the wailing and screaming to a minimum. What should I wear for ziplining? Clothes. We are big on that, since other people have to wear these harnesses when you’re done. Casual jeans or cargo shorts are a good choice, as are closed-toe shoes (just to protect your little toes when you land). We do not recommend going “commando”. Just be comfortable and able to move freely because swatting those flying squirrels isn’t easy. Is your ziplining program safe or is it set up like an amateur backyard WWE wrestling match? Our tours are registered with the PA Department of Agriculture Rides and Measurements Bureau, and our course designs rise above the standards of the Association for Climbing Course Technology. You’ve come for an exhilarating and safe ride, and our staff is sure to show you one. In fact, one of our favorite safety features is our upgraded braking system. With this newer version system, each line is set to allow gravity to slow you down and, as an extra precautionary measure, there is also a backup brake that is controlled by our highly-trained staff. This alleviates any worry you may have about needing to brake yourself. On our long and speedier ziplines, we use a patented breaking and retrieval system called ZIPKea. This ziplining brake system brings you in nice and smoothly based on what range of speed you’re coming in at. What if I’m too nervous to finish the tour and didn’t get the memo about not going commando? Hey, flying through the tops of trees isn’t for everyone. We can’t speak for the other people in your party, but we will be completely sympathetic to your nerves and help you make your exit as inconspicuously as possible. We aren’t able to offer refunds though, so we hope you’ll challenge your fears. We promise you’ll go home with all your body parts intact! You’ll also take home a great tale about how you flew through the skies of Pennsylvania and had the time of your life! 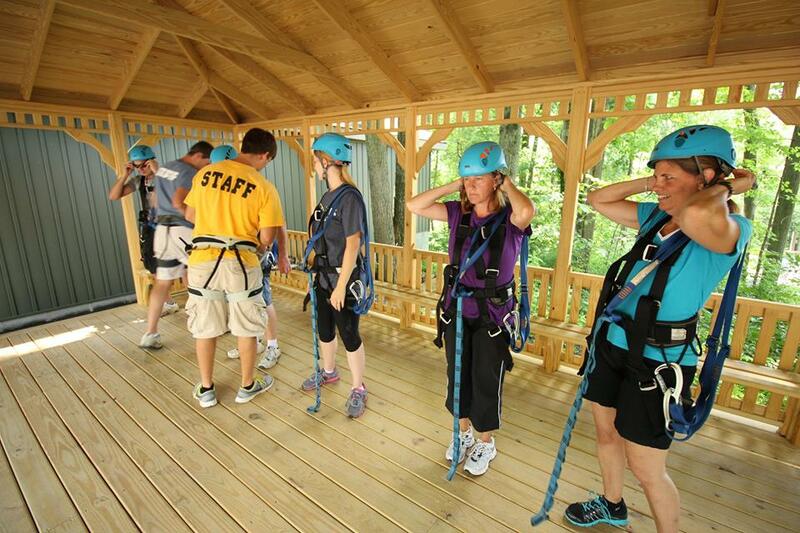 Are you ready to try ziplining? Click here to view our options and book a zipline tour today. Still not convinced? Check out Rachel’s experience of ziplining for the first time (and overcoming her fear of heights). Know someone that you’d like to try ziplining? Send them this article to help motivate them to take the plunge! Editor’s Note: This was first posted on 4/10/2015 and was updated on 8/21/2018.